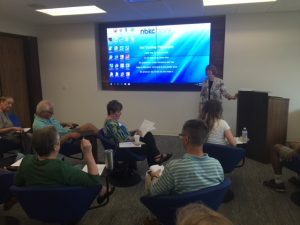 Judy presented Irreversible Sales Blunders in cooperation with the Kansas City Better Business Bureau and NBKC Bank on August 14th. Understanding behavioral styles takes the guesswork out of interacting and communicating with others. You’ll be able to assist more clients – not just those with whom you naturally connect. You’ll be able to reduce the time it takes to connect with prospects. Marketing and sales challenges of your style and how to address them. Understanding this will help to reduce frustration and direct your marketing efforts in ways designed to reach and follow-up with more clients, leading to bottom-line results. Each style has strengths that help them in the marketing and sales processes. Each style has struggles unique to that style. These weaknesses can lead to irreversible sales blunders! Finally, we’ll cover how to tailor your marketing approach to appeal to the needs of your client’s style. This will accelerate your marketing efforts and improve your client satisfaction. Each behavioral style has unique needs they want to satisfy. You can help clients more effectively by understanding those needs from the beginning of your first interaction with them and designing a marketing approach that fits their needs. Failing to do so is an irreversible sales blunder!